All nesting dolls are painted by hand. There is the author's signature at the bottom of the first of the dolls. The enclosed doll consists of 50 places. 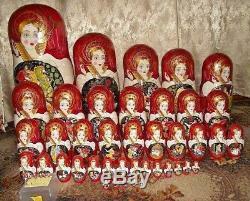 The height of the first Russian doll is 65 cm (almost 26 inches). 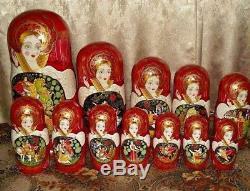 All our nesting dolls are painted in high quality dark, watercolor and acrylic paints. We use gilding in accordance with the author's technology in painting. The image is fixed with a good layer of varnish. All work is done with high quality and beautiful! We are responsible for our work. All our works are an author's design. We draw every nesting doll from 10 to 30 days, it all depends on the complexity and volume. The term is specified for each doll in the ad. We can shorten the period at the request of the customer, but quickly paint a good picture is impossible! Each breeding doll is individual. The photo shows a sample. We allow a slight deviation from the presented sample. This is a hand painted!!! We ask to consider this. But worse pictures will not be! We guarantee beauty and quality! Our family studio "Matryoshka" has been operating since 1989. All paintings are originals, made in accordance with our sketches. This is not a remake of other people's work. All our works are done individually for each customer, therefore return is impossible! Before sending, I will send a photo of our work for approval! We pack our dolls very carefully. Damage during transportation is not possible! There were no damages during mailing! We will not be able to provide a discount of more than 5-10%. Sorry for my English I translate from Russian via Google translator. 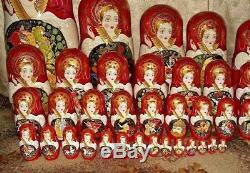 The item "Author matryoshka, 50 pcs, 65cm (26), lacquer miniature, the artist's signature" is in sale since Sunday, November 25, 2018. This item is in the category "Dolls & Bears\Dolls\By Type\Nesting". 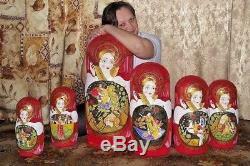 The seller is "matryoshka-doll-ooak" and is located in , default. This item can be shipped worldwide.